Just at this one meeting the History Museum gets $145,000 (https://blnnews.com/2017/08/27/bloomington-supports-friends-with-your-money/ ) and the DBA doesn’t need to support itself. You get 2 new employees with gold-plated benefits and pensions! Another $289,305 sucked out of your wallet! Page 6 lists the people who don’t have to try to make the DBA work anymore. Any downtown businesses belonging to the DBA don’t need to contribute anymore either. The City will be in charge and using your money. This doesn’t include the outside elevator Madigan also wants. See Madigan’s 2016 letter on page 183. The building opened in 2008, the original inspection was 2010. The contract with Grossinger Motors requires the City to make their best effort to use the new name. Evidently that doesn’t apply to bad news since the new arena name is not on any docs for tonight. Does Tari still have his PCard? I hear S. O’Rourke worked on his campaign. He ate at the Marriott by himself? D. Bentley? Really? How many meals were “Public Funds used ONLY for Public Purposes”? Posted in BloNo, Bloomington, downtown hotel, Hales, Local, pensions, Renner, Taxes.Tagged coliseum sidewalks, DBA, Downtown Bloomington Association, Lisa Madigan, PCard, pension expense, Tari Renner. spend it like you stole it ..
basically we’re no longer Mayberry , we’re becoming Chicago . how can we survive with out growing more bureaucracy , and expanding debt . we don’t need to worry about stuff , let the next generation handle a massive debt and crumbling system . How about contracting the Coliseum ADA sidewalk work to Rowe/UCM? Their work is known to last quite a bit longer. No joke it might pay to do a study on that. The deadline is the end of December to comply with Lisa Madigan’s ruling. They’ve known about this for quite a while. Last minute action results in limited choices. YEP! Finnegan WAS a good thinker UNLIKE his blonde brain dead “aftermarket” council person. Why the rush to satisfy Madigan. Coluseum is a ghost town… no shows for months. Good Grief! 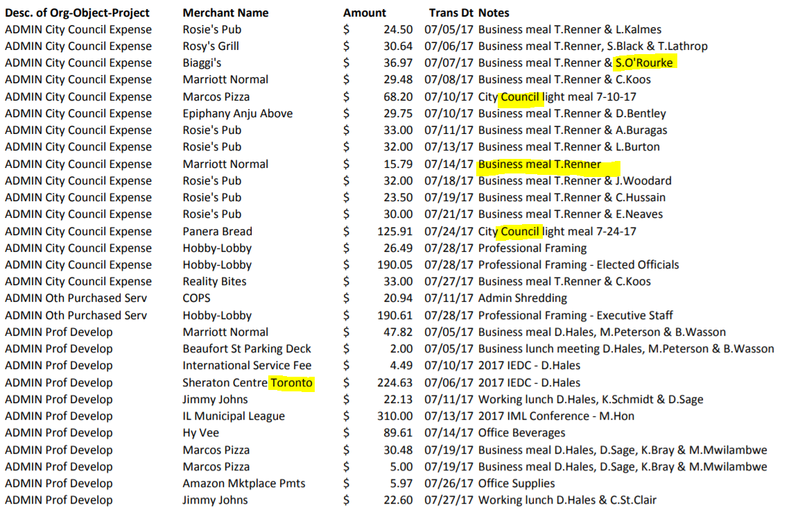 The man spent $350 on lunches for himself and his buds in 22 days! This is why I got my taxes jacked? Seriously? He doesn’t even PRETEND to care that we sacrifice our labor, wages, and property to contribute to this so-called “social contract” that we are supposedly a party to. If we are to be forced to participate in such a contract, then would it really too much to ask that our servants be wise and prudent trustees of our sacrifices for the community? Apparently it is a bridge too far for some. I wish his Most Rebuked Dishonor godspeed and a good recovery from his medical issues, whatever they may be. Mike Sprague helped the city of Bloomington get saddled with the Arena? He could have voted No to deny it? Thanks for nothing! Previous Post Remember the Connect cameras?